There is a war raging behind the scenes that is leaking out into the public domain. Our Deep State has grown into an abomination of people who do not realize that their actions are hurting our nation far more than the "help" they think they provide. When one pursues security, they will wind up with neither freedom nor security. But when one pursues freedom, then security will follow at very little cost. Freedom and security are directly tied to one another and cannot be separated. If you go overboard in your pursuit of security in any aspect of life, then you will ultimately surrender your freedom. When embraced as a guiding principle, this understanding will strip bare all important decisions in life, be it in your personal life, your relationships with others, in your work, and in all aspects of government and politics. Super important, and you can better believe we’re going there. It is my belief that the CIA, NSA, Department of Homeland Security, FBI, and by extension Congress (since they approve it), are completely out-of-control. Combined they are too large by about 90%! That's right, 90%. Our nation and the world would be much better off if they did not exist at all versus existing in their present condition. What a waste. But you have to understand that the Deep State exists as a TOOL of the global elite. They create money from nothing and have used that money from nothing to indebt and enslave the entire globe. They make money from nothing and use that money to elect puppet politicians and puppet judges. Thus they have circumvented all the checks and balances of the Constitution. There are no longer three branches, there is only one, and it is NOT controlled by the will of the people. The Constitution states that CONGRESS, your representatives, shall "Coin money and regulate the value thereof." But by a known and open conspiracy Congress turned over their obligation to PRIVATE individuals in the year 1913 with passage of the Federal Reserve Act. This was a history supernova. That act is ILLEGAL and UNCONSTITUTIONAL. It corrupted all laws that were created since that time. What followed was the IRS Act the very next year. They blew a bubble that became the "roaring 1920's," that led to the crash of 1929. Then came the bond market crash (debt), then came WWII. The central banks used WWII to foist the Bretton Woods Accord on the people of the planet with only a sham of due process. Out spilled the illegally create United Nations, the "World Bank," (they are still laughing over this), the IMF, the BIS, all of which are improperly not monitored or authorized by anyone but themselves. It's a sick and sad state of affairs, I'll be bringing you much more on all this in my upcoming book, "Definitive Freedom." While I supported Trump over all the alternatives, the impossible math is the only way to glimpse economic reality. No source that I’ve seen understands where the math is headed. And with the first cut of Trump’s budget priorities comes a focus on the way in which the impossible math is distributed, with no discussion of how impossible the math is or why. In a nutshell the debt is growing and accumulating at twice the rate predicted by both mainstream and non-mainstream sources alike, this article will show you how to glimpse the reality of the math. While the national debt almost doubled under eight years of Obama administration going from $10.02 trillion to $19.95 trillion (it was far worse than this in reality, we’ll cover that later). This 99% growth in just eight years means that the national debt effectively doubled in just eight years. That’s terrible, but most people are projecting the same $1.25 trillion growth per year for the next eight years, or a total growth that will equal another $10 trillion. That is NOT math reality. The reality is that regardless of who is president, the math must double again in the next eight years in order to achieve the same rate of growth! $20 trillion, not just another paltry $10! In other words, at the end of eight more years, the end of 2024, the national debt will likely stand at $40 trillion, not the projected $30 trillion. If that RATE of growth is not maintained, then what do you suppose will happen to the economy, knowing that all our money is DEBT? But why is it that nobody can do a projection that matches reality? Reality does not exist in ANY mainstream media. The mainstream media is 90% fake, every bit of that is designed to fill our heads with a story-line that manipulates and enslaves us, robbing us of our productivity and holding back the advancement of humanity. The 10% that is real is obscured by the majority 90% spin. If you incorporate their narrative, you will consume unfit foods, unfit water and drinks, drugs, medicines, and vaccines that will make it impossible for you to think clearly enough to distinguish what is real and what is not. You will likely work in jobs that perpetuate and are dependent upon enforcing the mainstream narrative (most people do not realize the part they play). The internet is the ONLY place that reality exists. But you must be able to think and filter knowledge clearly in order to see it. Most people have not been taught to THINK. To filter correctly you must intensely focus on each subject looking for inconsistencies. Thinking is a process of removing inconsistencies until you have a clear, consistent, and simple picture in which all the pieces fit together without conflict. You will not even find reality in a modern library; it, too, is filled with nonsensical thinking that has been poisoned by corrupted mainstream science and ideology. EQUITY: An increase or a decrease in equity (stocks) primarily affects the person who owns it. Thus, if the stock market falls the individuals who own it are negatively impacted, but the wealth effect is very narrow. Equity is a one person transaction. The person who holds equity cannot default, they can only lose their investment thus the ripple effect of lost equity is small. If you were to lose all your equity holdings, no one will come after you for payment, you will be angry with those managing the companies you owned, but there is no recourse. DEBT: Debt, on the other hand, is a two person transaction. When a debt is created there is always a person who is on the other side of the transaction. If the person who owes the money, the debtor, defaults, then the person who loaned the money will come after your assets to recoup losses. THIS IS WHY DEBT MATTERS, and equity doesn’t. Wars are fought over debt, not equity. The entanglement of debt across nations means when debts cannot be repaid, or even if faith is lost that debts can be repaid with money of value, then emotional anger ensues. We are riddled with more debt, by far, than at any other point in history. It matters. Those who ignore it are ignorant of history, and believe that the math is fantasy. The math of debt is NOT FANTASY, it is real and is woven into the people on both sides of the debt transaction. DERIVATIVES: Derivatives that are based upon debt (sliced and diced), leverage the debt (leverage upon leverage) and obscure reality. But the underlying debts still exist, even if created under an improper rule-of-law as most modern debts are. Derivatives not based on debt are fantasy, they are not reality, but like debt their impacts are entangled beyond just one person or entity. In that regard derivatives also matter, they represent systemic risk. The deluded thinking is, that no matter what, more debt can be produced, thus default will never occur. And that government debt is somehow magically different because it’s backed with nuclear warheads, oh, and the ability to tax the living heck out of you and me. Not mentioned is how insane and absolutely ridiculous it is that our unsovereign government borrows money from PRIVATE individuals and uses our tax money (productive effort) to pay those privileged private individuals interest. Dr. Bartlett’s rule of 70 is the same as the more common “rule of 72” except that he rounded the number to make the math easier. So, to see the doubling time of our current account deficit we need only look at the past eight years, because the deficit almost exactly doubled in the past eight years. If you divide 70 by 8, then you will find that the past eight year doubling equates to an annual growth rate of 8.75% per year! If that rate is maintained, then in the next 8 years our debt will DOUBLE again. From $20 trillion, to $40 trillion. Again, the mainstream assumption is that our debt only continues to grow at the current per year dollar amount of $1.25 trillion per year, but that is NOT the case. Should the 8.75% growth rate of debt not continue, then growth will slow and the real economy will turn more negative than it is already. So another doubling does not have to happen, but there are consequences if it does not under the current criminal central debt as money system. If, however, the growth rate continues to escalate as it has been, then a crackup boom is likely. A crackup boom results in things close to the production of money rising in value, while those further away stagnate. So things like stocks, gold, silver, Bitcoin all get speculated higher, while food and necessities get more expensive relative to stagnant incomes. Note that in the Diminishing Returns chart above that the rise seen in 2010 is due to the FED taking on $4.5 trillion onto their balance sheet! That debt would have otherwise been added to our national debt, thus the stated $20 trillion is actually $24.5 trillion today! Cough, cough. Of course it’s much worse than that, but let’s ignore unfunded liabilities and all the other giant sums hidden under ginormous carpets. Of course the FED did this to prevent collapse. What QE did was to temporarily unsaturate the debt, thus the spike in the 2010 Diminishing Returns Chart. By simply moving that debt from a current payable to an even more distant payable (an "asset" on the FED's balance sheet), it created more room for debt to be pushed into the economy, mathematically. QE was the most effective tool to date for modulating the saturation point of debt within the economy. 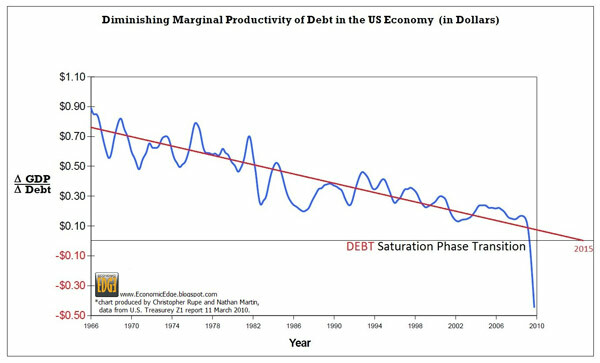 BUT, we are now back into full on saturation where adding debt creates negative growth, not positive growth. And so, the game of private central bankers modulating the economy with tricks continues for now. They steal our productivity while the impossible math continues to become even more impossible. If the FED begins to reduce their balance sheet, look out below. If they feel the need to increase their balance sheet, look out above. When does the music end? It ends when the people are no longer willing to tolerate giving so much of their productive effort to a criminal enterprise. In the meantime, look for the next economic blackmail to come soon, very soon. Super video, very important to understand the power of decentralization. Bitcoin is going to erode the power base of the central bank and they do not yet realize how profound this transformation will be. I believe this technology is a major part of a proper path forward, support its use fully, and own some myself. Later, and in my new book, I will explain the historical significance of it and how I think the concept of decentralized systems like Bitcoin can be used alongside of other forms of "money" in order to make a more diverse and robust system overall, one that has options outside the hands of the criminal central cartel. Bitcoin is a HUGE deal. Much larger than most believe, historic. If you are not yet participating, you should be. I recommend that you go to Coinbase and start your account today! Over a year ago I sold my latest two businesses and have been waiting for the right time to come back into the public domain. I plan to do so in a big way, but not quite yet. The impossible mathematics that underlie our economy are unbelievably more impossible today. The markets are less real, and more overvalued than at any other time in history. Future returns from valuations above 20 are statistically unlikely, and they are bordering on impossible from these levels on any type of an extended timeline. Accounting standards have continued to relax and if GAAP accounting standards of 15 years ago were used, then P/E ratios would be through the roof. Over the past several years many pundits have been premature in their calls for a market top. A significant mid-term top is now near. Today’s move higher after the FOMC likely will mark the beginning of the last wave higher before the next decline. It will not likely be, I believe, THE decline. There are high odds of volatility returning in both directions. Eventual further upside will be the result not of underlying fundamental strength, but of monetary implosion. Europe implodes first causing funds to flow to the U.S., and that has been occurring for some time now. Japan implodes next, then the U.S. and the rest of the world, in that order, but it will still take some time to play out. There is a war going on inside our nation and around the globe. The two sides are Faction A which is the Globalist socialist Deep State central banking cartel, and Faction B, currently lead by the new Trump Administration representing us proud to be Americans, non-socialist, decentralized, Constitution abiding, thinking and aware faction. I could write much about the criminality in the CIA, the FBI, NSA, Homeland 'Security', in the Justice Department, in Congress, the Senate, the media, the judicial branch, and many others. And I will, but not here and not just yet. I 100% foresaw Trump’s victory and was rooting for it. However, while he’s a truth teller who is right 90% of the time, it is the 10% revolving around the root of our problems (central criminal banking performed outside a proper rule-of-law) that will doom the remaining 90%. Thus I do not expect significant resolutions to any major problems. I expect a war cycle that was going to happen regardless of who took the White House. I also expect the markets to be intentionally taken down (by the criminal cartel) as a part of the ongoing war in an attempt to control faction B (it will be unsuccessful). I think more and more "Truth Bombs" will explode in public as the truth will be used in defense during what I believe are the early stages of this war. These truth bombs are going to expose further the deep state, and will expose technological and other secrets that have been withheld from the public. Right now I’m working on a new holistic book called “Definitive Freedom.” This is a huge project that is going to take a while. This book is meant to be holistic, spanning many subject areas in which our Dreams have been corrupted and our thoughts polluted. This book will not just point out root issues, which it does; but it will concentrate on reality, what is a true and proper rule-of-law, and how to build a more proper rule-of-law as the current very flawed system unravels. As I work on Definitive Freedom I will occasionally post non-time-consuming items of interest here. I am also working on a new, much larger, website and will update you on that as it becomes ready. In the meantime feel free to contact me if you like, as I get time I may answer a few pertinent questions here, but will be focused on progressing the book and the new website before making regular posts.